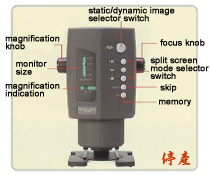 Inf-500 is regular-type CCD microscope that can be easily operated for a wide range of purposes.Magnification can be changed up to 500x without changing lenses.Using static image memory,the monitor screen can be split into two or four screens which is necessary for comparing objects.It has a number of convenient functions that can easily used by anyone such as transmitting images to a PC. The microscope will increase the efliciency of quality inspection and research/development activities. 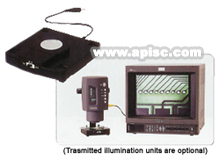 Transmitted illumination allows for even clearer images of some objects.Stable,high intensity transmitted illumination units catered to specitic objects are also available. 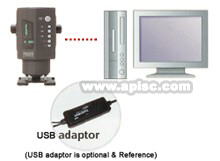 Data of magnified images can be transmitted to a PC so they can be used to analyze images and store data.By using a NTSC/USB adaptor,images can be used on computers with a USB port. •Clear images from ∞(infinity) to 500x can be observed on a TV screen. 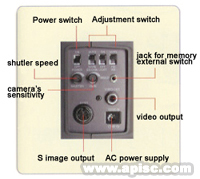 Any magnification,from ∞(infinity) to 500x,is possible by simply turning a knob without changing lenses.Simply connect the equipment to a regular TV to see the images. 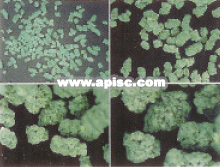 Magnified images can be stored as static images and seen on two or four split screens. This function is very convenient for comparing objects. Images can be seen on a regular TV,printed out,or projected on a large screen using a liquid crystal projector.You can also create a system that allows you to use magnified images in a variety of ways.For example ,by connecting the equipment to a PC,you can see images on the PC screen or store data. Static image Static images can be seen on one screen or two or four split screens. ※USB cable is not included.